The USDA Rural Housing Loan is a program created by the US Department of Agriculture to help improve affordable homeownership opportunities for low-to-moderate income families in eligible rural areas. The home must be intended as your primary use and is not available for investment properties or 2nd homes. The USDA Rural Housing Loan can be offered by approved lenders throughout the US, so applying for the loan is very similar to applying for most other mortgages. What are the Primary Benefits of a USDA Loan? Given the USDA Loan is backed by the government, it comes with a lot of advantages that the other government programs (VA and FHA) offer. Interest rates fluctuate daily across the nation for each lender, so when determining what’s a “low” interest rate is based on the current market. That said, compared to interest rate of other home loan options, the USDA rates are always some of the best in the nation. Typically, the interest rate on a 30-year fixed USDA loan is anywhere from .25%-.75% better than a Conventional Mortgage. Unless you put 20% down on a Conventional Loan or qualify for a VA loan, you’re likely to have mortgage insurance. Most conventional mortgages, FHA loans and USDA loans require mortgage insurance. Of all the loan programs, Rural Housing loans have the lowest fixed monthly mortgage insurance. On a USDA loan the mortgage insurance (called the ‘annual guarantee fee’) is set at .35% of the loan amount. Other loan programs are often higher. FHA’s MIP (Mortgage Insurance Premium) rate is set at .85% of the loan amount, and the PMI (Private Mortgage Insurance) on a Conventional loan can range anywhere from .35%-1.5% of the loan amount per year. With USDA having a fixed mortgage insurance rate of .35%, it allows for the monthly payments to be far more reasonable than other loan options. The USDA Loan is best known for requiring no down payment and is by far one of the greatest benefits it offers! Other than the VA Loan, no other program offers such a benefit. Conventional Mortgages require anywhere from 3-5% down while FHA Mortgages require a minimum of 3.5% down. 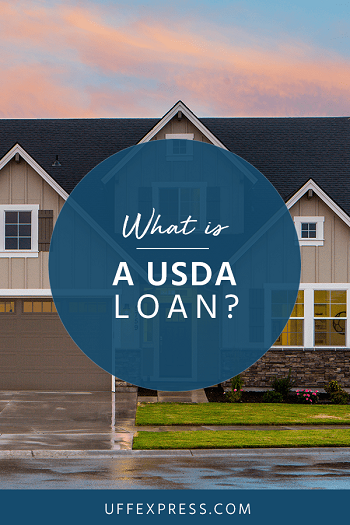 Who Can Qualify for a USDA Loan? For a more in-depth look at qualifying for a USDA loan, visit our article that explains the Rural Housing Loan in more detail. Ability to prove credit worthiness – this is somebody that has done a decent job of making payments on-time to past creditors. Typically, you must have a minimum FICO of 640 to be eligible for automated underwriting, however borrowers with lower scores may still be eligible, but they must go through a manual underwriting process which can be more stringent. You must meet the income requirements set by USDA, which is set at 115% of the area median income level. Must have an acceptable debt-to-income ratio, which can vary but generally is a maximum of 41%. The challenge to meeting the income limitations is that USDA looks at the total household income and not simply the income of the individual(s) on the loan. This can sometimes present an issue if there are multi wage-earners and one makes a decent amount of money. Or possibly a family that has a grandparent living with them (as their pensions or social security income would be factored in the income limit calculation). While being in a ‘rural’ area is subjective, the home may not need to be out in the “sticks” to qualify. USDA sets the parameters on eligible locations and even some suburban areas qualify. The actual definition determined by USDA of a rural area is an area with a population under 35,000, is rural by nature, and is underserved when it comes to offering mortgages to low-to-moderate income families. Confirm that you’re likely in a good spot to qualify for a mortgage. If you’re not sure, check out the “Buying a House” guide linked to above. Get pre-qualified by an approved lender. You can inquire directly on our website or give one of our licensed loan officers a call to assist you. Provide necessary documentation that the lender requests to verify things such as income and assets (for possible closing costs). Contact a realtor to assist with searching for a home. If you don’t have one, we can also assist with that. Get with your loan officer to help walk you through the rest of the process. As you go through underwriting, wait for title work and the appraisal, it takes nearly a month to process. So being patient is key! Once your loan has been approved, then you can close on your new home! When you're' ready, we've offer a secure, safe and quick way to apply for a USDA Loan. Is the USDA Loan a Good Choice for You? USDA loans are one of the best options in the country for nearly all borrowers, assuming you can qualify and meet the requirements. It’s very important to speak to a qualified loan officer early on to help with the calculations of income and debt-to-income ratios, as those can be some of the most challenging to determine on your own. But if you meet the criteria and are looking for a home in an eligible area, there aren’t many options that offer more affordable payments and a small cash investment to get into a home!